For most winter sport enthusiasts living in Spain, it can be tricky to find a good ski resort that is not too overcrowded. While La Molina and Boi Taull are very good resorts, their proximity to Barcelona, while convenient, means that they are often packed with skiers and snowboarders, making it difficult to have an enjoyable ski trip. If you travel just a little bit further towards to border with France, you will find yourself in the beautiful Principality of Andorra. 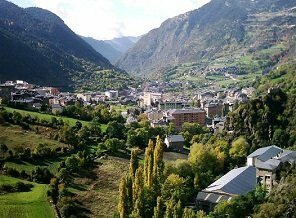 Nestled in a valley, the town of Andorra has become well-known for it´s tax-free shopping and ideal location between all of the different surrounding resorts. Whether you are the adventurous type that wants to go mountain-climbing, hiking, canyoning, biking or riding on horses, or whether you are the relaxed type that prefers spa treatments, massages, and shopping – Andorra has something for anyone during the Spring and Summer months. Home to the famous Caldea Spa, Andorra has grown into a well-known center for beauty and therapy treatments, since other establishments have opened their doors also offering slimming, balneotherapy, cellulotherapy and anti-stress therapies. 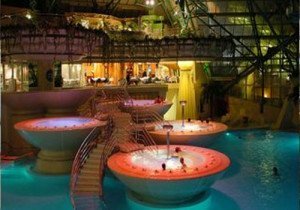 Caldea is the most famous however, since it is the largest spa in Southern Europe, and attracts visitors from all over the world. Caldea is also a hotel, offering combination packages in conjunction with the spa itself. See their website for information. If you visit Andorra from Barcelona by car (instead of the bus that travels back-and-forth from Barcelona), it is definitely worth your while visiting Naturlandia, an outdoor activity park which is where you will find the Tobotronc – the longest Alpine roller coaster in the world, measuring over 5300 meters in length, with a drop of 400 meters. 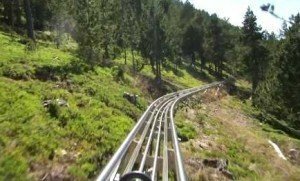 There are also other fun activities for the whole family, including bow-and-arrow shooting, horseback rides, and the Airtrekk – the biggest sky trail in Europe with its 54 different features and 3 levels of difficulty. Since the main season for Andorra is Winter, you can find very good package deals for hotels in the off-season, many of which have their own spa or sauna and steam rooms, as well as massage and beauty treatments. On top of that, Andorra is also famous for its duty-free shopping, which is excellent for finding great bargains on anything from clothes to electronics.